Often known as Museum film, this product is used in Museums, Art Galleries, and National Trust properties to protect valuable fabrics and artefacts against fading. It may also be utilised in domestic properties and shops where fading due to UV is a potential problem. Fading can be an expensive problem for many businesses and homes. It is a common misconception that ultraviolet rays are the only cause of fading. 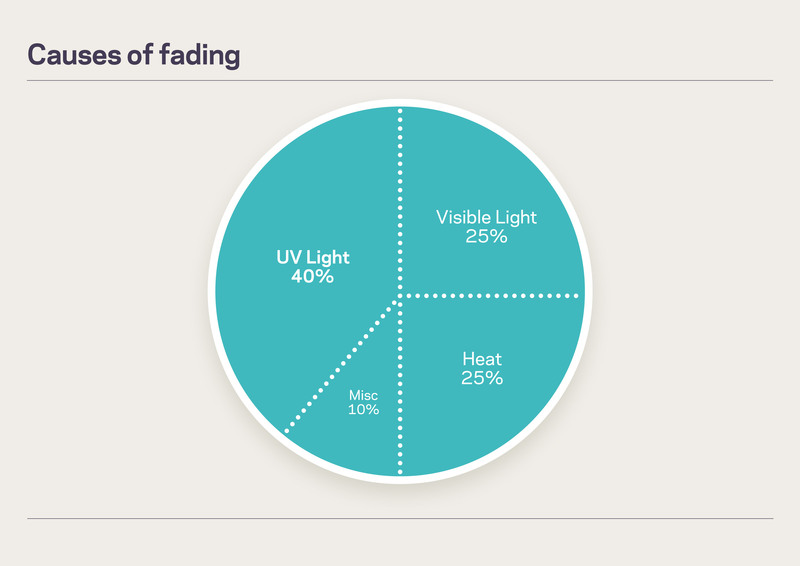 As you can see from the pie chart below it shows the causes of fading, UV rays contribute only 40% to the fading problem. Heat and light contribute 25% each. The remaining 10% is caused by other factors such as bad ventilation, artificial light and the quality of the dyes in the furniture or fabric. All of our specialist applied window films to help reduce fading can filter up to 99% of UV rays. The amount of heat and light that the window film can filter out is mainly down to the appearance of the film. For instance a reflective film will reduce more than a none reflective film.